I have often heard my colleague, Rey Descalso, use the analogy that investing is similar to driving a car. On highways, with minimal traffic, we go the full speed limit. Maybe slightly faster, depending on the type of drivers we are. In rush-hour traffic, we should ideally slow down and proceed with a greater degree of caution. In 2017, we had market conditions equivalent to that of highway driving. Then in 2018, we hit some rush-hour traffic. The type of market conditions the future will bring is unknown. However, I wanted to share a few of my reasons for reducing speed in 2018. 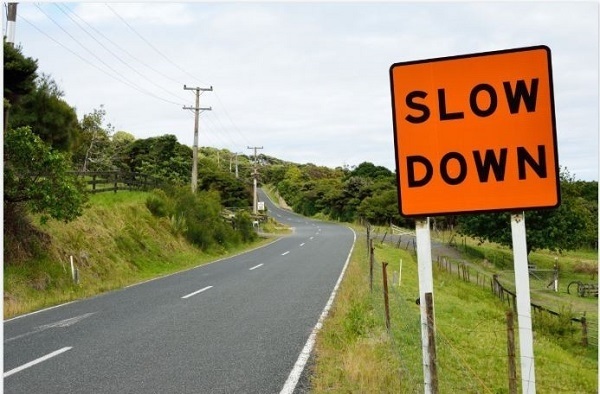 I will continue to follow a lower speed limit in 2019, until I feel traffic has cleared. One of the more noticeable occurrences in 2018 was the expansion in volatility. The VIX is sometimes referred to as the "fear index" and is used to measure expected volatility in the market. 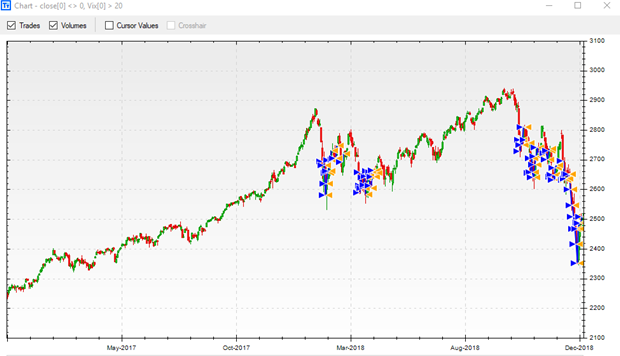 Below, the blue triangles overlaid on a chart of the S&P 500 show all the times from 2017 through 2018 when the VIX closed greater than 20. I merely chose to use 20 as my reference, although, there's no special significance behind this value. It is simply an elevated level that is rarely reached during calm markets. Notice the number of marked volatility events in 2018, whereas there were none in 2017. There is an old saying that "the trend is your friend" - meaning, it is beneficial to take trades in the direction of the overall market, not to fight it and trade in the opposite direction. When looking at a chart of the S&P 500 on a monthly time frame, we note that price is trading below both the 12-month and 20-month simple moving averages (SMA). In 2011, 2015 and 2016, price traded below both these averages - but shortly thereafter, price was making new all-time highs. However, in 2000 and 2007, trading below these averages was the beginning of a more prolonged downtrend. As it stands currently, we are trading below both the 12-month and 20-month SMA. Moving averages do not forecast the future, they merely show the average of price over a given timeframe. It is simply a point of reference that causes me to err on the side of caution. The 200-day SMA is used by many traders as a basic trend filter. When above the SMA, we consider price to be in an uptrend. When below, we consider it to be in a downtrend. 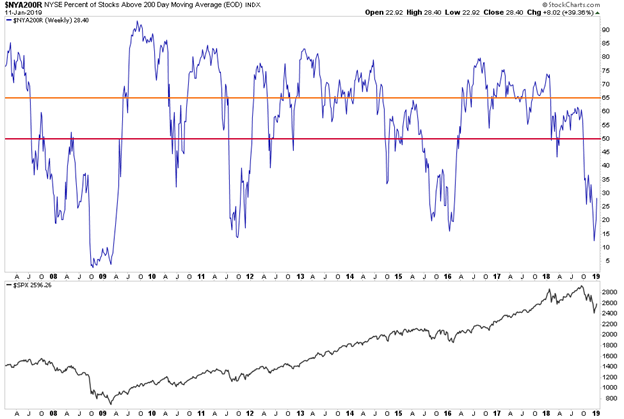 The percent of stocks trading above their 200-day SMA on the New York Stock Exchange (NYSE) is quite low. Investors and traders have different zones they may choose to use. I personally use the 65-percent level as the first warning line. Then, anything below the 50-percent level would have me monitoring conditions much more closely. On the chart below, the blue line in the top half represents the percent of stocks trading above their 200-day SMA on the NYSE. I have manually placed an orange line at 65 and a red line at 50. In the bottom half is a chart of the S&P 500. It enables us to visualize prior swings in the market against prior levels on the indicator. We are currently below the level, which tells me to proceed cautiously. The 52-week high-to-low ratio is another indicator I like to monitor. Toward the end of September 2018, we began to have fewer new highs. 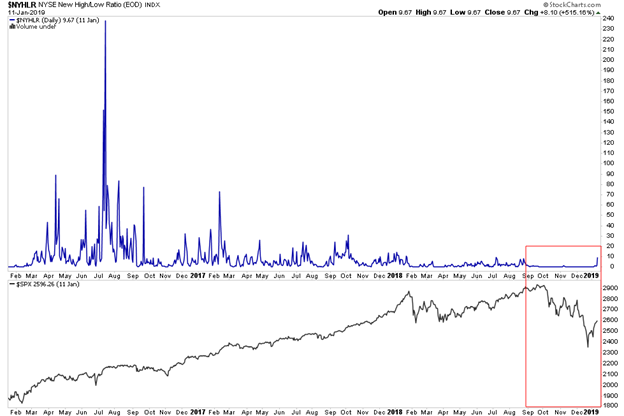 In the image below, the top section represents the ratio of new 52-week highs and lows on the NYSE. The bottom half is a chart of the S&P 500. I've placed a red rectangle in the bottom right, which highlights the period since the October 2018 sell-off began. An easy way to visualize the chart below is to imagine it's like an EKG printout. In strong uptrends, I expect some bouncing around with strong spikes to the upside. When we begin to somewhat flatline, it tells me to remain defensive until proven otherwise. 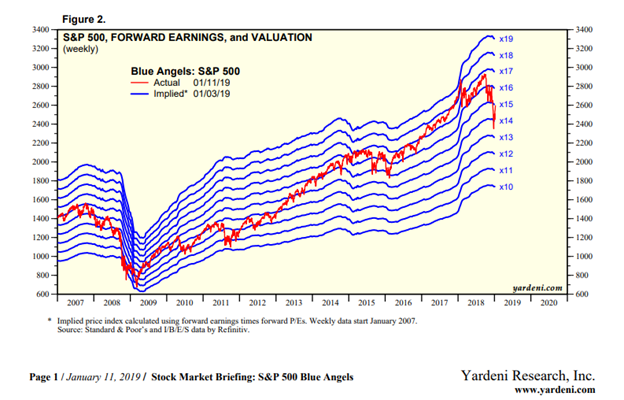 The Blue Angels, from Yardeni Research, show forward earnings and valuation for the S&P 500. My strength is not in fundamental analysis, but I find it complements other technical indicators. The Blue Angels appear to be rolling over and could be beginning a downward trend. It garners my attention because similar slopes of this indicator in previous years have marked some volatile times. It also helps to confirm fundamental levels, which may align with technical support and resistance levels. The stock market is incredibly difficult to read and will keep you at maximum uncertainty. Some of the indicators and things I've mentioned above are not all that concerning in and of themselves. However, when a handful of indicators begin to confirm each other, I switch from offense to defense. I will remain more defensive until these indicators, and many more, show sustained improvement. The current sentiment is mixed. There are those who believe we are beginning a new uptrend. Then there are those who believe we are entering a prolonged downtrend. Either is possible. It's also possible that reality could lie somewhere in the middle. Not all years have to be directional. Sometimes we can grind sideways in a large price range for extended periods. A great example of this type of range is 2014 through the beginning of 2016. The wonderful thing about following a rules-based approach is we don't have to guess. We simply react to the rules once triggered. Follow your plan in 2019 and drive in the manner in which you feel comfortable. If you would like to find out more, click here.